Now here comes another myth, many people have misunderstood that it was Japanese farmers who formed this two-part baton originally to fight against the samurai in the feudal era. But this myth is completely wrong because the real nunchuk is an Okinawan weapon, used in martial arts, and it consists of two sticks joined together at one end by a small rope or chain. Nowadays, you will hardly find a nunchuck that is made by using ropes. Because in the modern times we have better material available for keeping the weapon from falling apart. You can even find a different variety of substances through which the sticks are made. 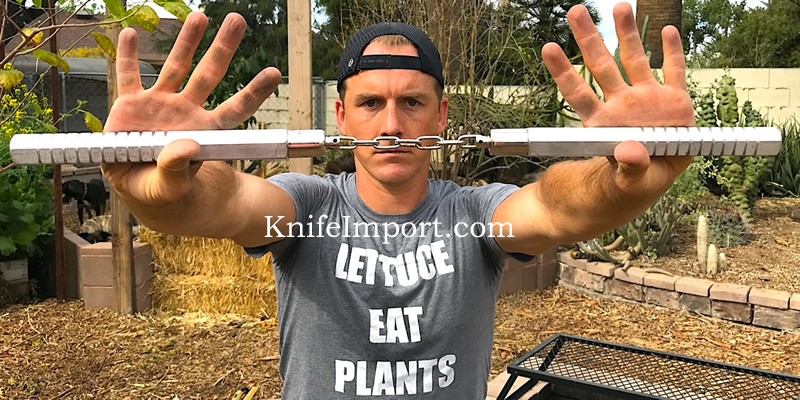 So, that provides you the option of buying not just wooden nunchucks but even metal and foam ones from, our wholesale online store, Knife Import. Until now, people are still unclear about the exact origins but historians have agreed on one single fact that the weapon was developed in Okinawa, over a long period of time evolving from a native horse bit to the straight stick like design it has today. How Dangerous Is This Weapon? We all know that any weapon that is not sharp, such as knives, or being sent towards a person at the speed of 2500 feet per second like a bullet, it cannot be that lethal. But in the hands of a mugger, it will still pose a great threat to the public, death is also a possibility. Perhaps this is why most legislations of American states banned the weapon in 1970, following the Kung Fu fever that Bruce Lee nunchuck fighting brought into the country. As the legal status of the weapons varies from state to state there are some states such as Arizona, California and Massachusetts that have deemed even the possession of a nunchuk illegal. Until recently, New York was included in the list of previously mentioned states. However, an enthusiast and martial artist Mr. Maloney won the case against the state to get its production legalized, thanks to the Second Amendment that gives a person the right to keep and bear arms. James Maloney first found out about the ban in 1981, after he was arrested for doing a demonstration of cool nunchuck tricks in public. 14 years later he graduated from law school and started towards his goal. Now, after a couple decades, he got the ban lifted from the weapon’s possession and production after winning the long fought case. We all know well that the US Declaration of Independence clearly states the unalienable rights, which the Creator has endowed on His creation, among them we find the protection of “Life, Liberty, and pursuit of Happiness”. Combined with the 2nd amendment, you are allowed to bear arms as per your choice. Still, the four states mentioned earlier have criminalized the imports, manufacturing and possession of nunchucks for sale or personal use. That’s why, it’s necessary to check the statutes of your state or county before getting involved with this mean weapon, which otherwise looks pretty civil in comparison to most pocket knives that can give lethal injuries to anyone who comes in its path. Is the Nunchaku Any Good? As explained over and over in this blog, this weapon seems threatening but it really isn’t. Yes, it can be used to hurt someone by hitting them hard enough to break their bones, give them some cuts and bruises, or rendering them unconscious. But it is no tactical knife or gun! If we compare these karate sticks to a whole solid stick, then even that is more effective. Because having a chain, or link, in between the two baton sticks only makes it weaker as a weapon. A Chinese bo staff will probably be more effective when it comes to inflicting damage in mid-range combat scenario. When we talk about real nunchucks effectiveness, you might wonder can we really use it for self defense? The answer is yes and no. You will need to have some training of using chukka sticks before being able to fight with them. In case you are thinking of start training with this weapon then make sure you buy foam nunchucks that are designed for this specific reason. Why? Because foam is a soft material and thus the hits you receive on your body, or deliver onto other objects, have no actual damage. If you are interested in Karate, or any other form of Japanese martial arts, then you must know how its asked of the martial artist to remember the names of each and every thing related to the form to remembered in the native language. This the reason why we think it is necessary to put forward the Japanese names of different parts of nunchucks for kids and adults alike. Kontei – that is the bottom of the handle. Kikonbu – the handle’s lower part. Chukonbu – name for the middle part of the handle. Jukonbu – is what the upper area of its handle is called. Kontoh – Top part of handles. Kusari – literally means chain in Japanese and thus it’s the name of the chain that connects the two handles of some nunchaku. Himo – label for the rope that connects the handles of few nunchucks. Ana – literal meaning of this word is ‘a hole’ and the name refers to the hole found on the top part of each handle for the rope to pass through, the weapons that use chains don’t have an Ana. Lastly, let us remind you that please read the statutes in your area of residence before you go out to put on a public demonstration using some karate sticks. Until next time, stay safe!